In 2015, a Civil Grand Jury indicted the office ranking it last in the state of California in practices and customer service. In the indictment, it listed all of the reasons why it was ranked last. The list was long and concerning. (Check it out here.) Amongst it were people receiving their tax bill years after they bought their home and the Office’s reliance on developer honesty as the basis for taxes on new construction. This needs to end. San Francisco’s elected position of City Assessor/Recorder is the most neglected position at City Hall. For far too long, it has been staffed by career bureaucrats who look at the office solely as a revenue generator while ignoring a huge part of the job - housing. San Francisco is in a major housing crisis, the likes of which have not been seen in a generation. Public servants, like City Assessor, have a duty to step up during times of crisis to innovate and work hard for their constituents, but that hasn’t happened. That is why I am running for City Assessor. Personally, I know what it is like to live in San Francisco with limited means. When I moved to San Francisco 15 years ago I had no job and no place to live. Amazingly, I quickly landed a job as an Oakland Unified School District teacher. My meager salary meant my only housing option was living with roommates in an older Victorian in the Lower Haight. I scraped by, but only because it was during a time when - even that arrangement - was affordable. While living in the Lower Haight I met my wife. Today, along with our two children, we live here in San Francisco - the place we’ve decided is our lifelong home. Being a resident of this City was only possible because it welcomed me and afforded me the opportunity to pursue my dreams. This is what makes San Francisco the best city in the world - who you are, how much you make and where you come from doesn’t matter. But over the last several years, it has lost its welcoming personality and feels as if it's only welcoming to a select few - those who can keep pace with our housing market. While at the same time, it is also pushing out the people we hold dear. As a Bay Area teacher and a former union rep, I have spoken to many people who feel frustrated, angry, and confused as to why they feel their community is pushing them out. As a real estate appraiser and small business owner, I’ve seen the pain on renters faces who are having their lives turned upside down through no-fault evictions. These experiences have afforded me a unique perspective and the foundation from which to help the people of San Francisco. San Francisco is a city of innovators. It's a city of people who take an old paradigm and redefine it. So, why are we still doing things the old way at the Assessor’s Office? For starters, the City Assessor’s Office has only worked for homeowners. That archaic way of doing business no longer works when half of our residents are renters. If elected, I will work for every San Franciscan. The first way forward would be to view the taxation process with a mind to understand our housing. This starts by correcting the huge amount of errors in our housing data. Take, for instance, the current Assessor’s clearly inaccurate and useless data which shows that 64% of our single-family houses have no bedrooms. The Assessor’s office also can’t account for 1,200 acres of land. Next, instead of financial planning outreach, my outreach would start with City Hall. Let’s create a program of low-interest loans to legalize the tens of thousands of illegal In-Law units that exist in San Francisco. Let’s offer property tax breaks and $0 permitting fees for people who legalize their unit and rent it at affordable rates. Numerous cities used property tax breaks to lure Amazon's new campus to their town, let's use tax breaks to bring possible affordable housing out of the shadows. Homeowners also need more advocacy and resources. I would also work with the public to educate homeowners and prospective homeowners about the new ADU laws and help them understand the property tax increases that occur with their construction. Too many people are in the dark about their own property taxes and liabilities. I would then reach out and work with organizations like Home Match to help support them in finding participants with extra bedrooms who might want to rent them out. Our mayoral election is in full swing and many of the candidates are talking about the housing crisis, its effects on San Francisco and how they plan on changing things. The housing crisis has been center stage with its pervasive homelessness, lack of affordable housing or the debate of Senator Weiner’s SB 827 bill. So, I decided to take a look at an affordable housing program in SF, the Below Market Rate (BMR) program. The BMR program started in 1992 and is a system that allocates a certain amount of new construction specifically for lower-income. Based on the code, if the condominium complex is larger than 10 units, the developer has a couple of options to fulfill the law. The developer can pay a fee into an affordable housing fund, it can dedicate a certain percentage of the units as BMR within the complex or it can build units at a separate location dedicated to BMR. And have enough savings for closing costs. There is also a rental BMR program and you can read about it here. There are no restrictions as to where they can be located based on the MOHCD’s website. The homes can be placed anywhere in the city. The reality is, due to current zoning, the program is essentially boxed into small portions of San Francisco because of its reliance on multi-unit condominium complexes. Another limitation of the program‘s reach is it does not purchase homes off the open market and incorporate them. As a result of these two factors, you can see from the map above, the BMR units are mainly located in the SOMA, Civic Center/Van Ness and Bayview areas. This leaves huge areas of San Francisco unable (or unwilling) to help support this important population. Limiting the available land for low/moderate income homes to only a small portion of San Francisco and combining it with a severe housing crisis, you come across the current situation facing many San Francisco families. The middle to lower socio-economic classes are being actively pushed out of what was once a diverse city. With our artists, teachers, nurses, and hotel/restaurant workers unable to realistically see a future in San Francisco, you see the largest exodus of residents than any other city in the United States. We cannot let the hemmoraging of our working class continue. The more I dive into the intricacies of past housing policies and how they are affecting the current housing dynamic, an HBO miniseries keeps popping into my mind. Show Me A Hero is about a New York town dealing with its past racist housing policies and the newly elected mayor has to deal with a court order to fix the city’s past segregation. Check out the character Mary Dorman from the mini-series. She is someone who I think we should aspire to be. Studies have shown that when the Fair Housing Act went into effect, zoning laws started to proliferate throughout the United States. San Francisco wasn’t immune and while it has changed throughout the years, we can still see the remnants of this racism in the map above. How Can The Assessor Help? For the last 20 years, the office has been run by appointees or career politicians with no understanding of the office or our housing market. This has taken a toll on our city’s understanding of its housing, part of which has led us to where we are today. I think this office can do more than taxes. This office can be a part of the solution. As a real estate appraiser working in the SF housing market as well as with the Assessor’s office for the last 8 years, I will bring an understanding of the housing market to the Assessor’s office that’s been lacking for far too long. San Francisco is a city of innovators. It's a city of people who take an old paradigm and redefine it. So, why are we still doing things the old way at the Assessor’s Office? For starters, the City Assessor’s Office has only worked for homeowners. That archaic way of doing business no longer works when over half of our residents are renters. If elected, I will work for every San Franciscan. In times of crisis, it is up to everyone to contribute to the betterment of our society. I will bring more than the bare minimum to the office. By focusing the office on understanding our housing, the taxes generated will be more accurate and as a result, our city will be in a better position to help its citizens out of this crisis. I have spoken to many people who are feeling the hardship of high rents. The people of San Francisco express frustration and anger at the impotence of City Hall against soaring rents. Repealing the Costa-Hawkins law would give cities all over California the option to implement rent control laws to protect citizens from out-of-control rents. Costa-Hawkins is a 1995 law which hamstrings city legislatures in two ways. It prevents cities from creating rent control laws on certain homes. It also outlaws vacancy controls which allow a city to set the limit for market rent on a vacant unit. Curbed has a more in-depth explanation here. San Francisco had already created its own rent control law prior to 1995 law. Rent control in San Francisco covers apartments located in apartment buildings built before June of 1979. It doesn’t cover condos or single family homes because of Costa-Hawkins. The map above shows where and how many units would be under rent control if the state ballot initiative repeals Costa-Hawkins. 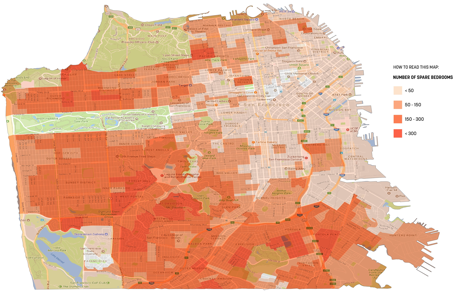 Over 100,000 units would be subject to current SF rent control laws. Most of these units are located in the west and south of the city. This would be a relief to many renters who fear their annual rental increase. The repeal would also remove the bully tactic of using extreme rental increases to force a tenant out, avoiding the relocation fees. Normally, when an owner evicts a tenant they must pay relocation fees that can run 10’s of thousands of dollars. A way around this is by raising rent so high that it’s impossible to pay rent. As a result, the tenant is forced to move. Unscrupulous landlords are basically evicting people without paying the relocation fees. Case in point here. I am determined to push the envelope on the responsibilities for the position. The Assessor’s main job is to find all property eligible for taxation, fairly assign a tax and let the person know of their tax responsibilities. But this limited scope of responsibilities is the minimum that the Assessor/Recorder does. I plan on taking the position several steps further. I plan on cleaning up and improving our understanding of our housing stock. Currently, the information/data on our housing is so bad our city agencies who rely on it have to get additional data elsewhere. Imagine having an office that has a thorough understanding of how many homes, bedrooms and living space San Francisco has. The second way I plan to help our citizens during the housing crisis is to start a public information program where property owners can effectively understand and predict their tax increases if they install/legalize an In-Law unit in their home. Empowering property owners is a top priority with my campaign. I will work with City Hall to start a program of property tax forbearance. This would allow property owners who choose to install an In-Law and rent it at below market rates to not incur the property taxes of the new In-Law. These are just some of the ideas I will bring to the position. I feel there is more to this position than just money. For too long, the bureaucrats running this position have been focused too narrowly on money when they could have been also helping San Francisco in its time of need. It's time to change that. It's time to put someone in the position who has a better understanding of housing in San Francisco. Looks like State Senator Scott Weiner saw my map and was inspired. However, the legislation he introduced would take my idea too far for a lot of communities here in SF. My idea is to put the power in the hands of the property owners. Mr. Weiner's would put the power in the hands of those who have the money for large scale developments. When the power is in the hands of developers, this can to lead to gentrification which is not in the interests our communities. If we can bring down the scale of his legislation to a more community-friendly version similar to mine then I can see more communities getting behind it. Public transportation has always been an amenity of living in San Francisco. Whether it’s BART, Muni, Light Rail, or even the cable cars, there has always been a way to get around the city inexpensively. And this is what many SF lovers want. They want an easy way to get around the city that doesn't include looking for parking, parking tickets or being towed. People have expressed they want to live near public trans. 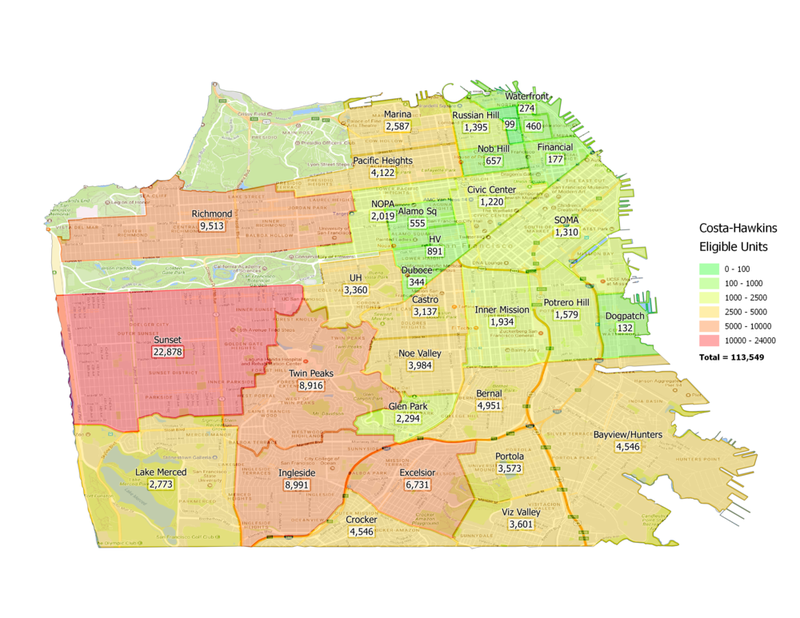 So I went to our housing data to see what it would look like if we had more housing near it. Using Assessor-Recorder Role data, I was able to create a map showing how many units could be created if we did small tweaks to our housing density near our major transport lines. Currently, the city has only made this possible, for the most part, on the street where the transit line is located. I thought, since people can walk farther than half a block, let’s expand our housing and create a larger transit buffer promoting more homes near our public transport. As a result, we could possibly increase our housing by almost 70,000 units. Wow. While new homes will not be built overnight, it is a way for San Francisco to say it cares for its residents, a way to reduce its ecological footprint and way to show forward thinking beyond today. This, combined with other ideas such as In-laws and density ideas I have mentioned at AccessSF.org, San Francisco can work for its citizens to ease the economic pressure causing Ellis Act, Owner Move-In and other no-fault evictions. These ideas are a win-win for San Francisco. The lack of productive dialogue and constructive debate on possible solutions was one of the main reasons for me to run for County Assessor. From my experiences, and those around me, I hope to show possible outside-the-mainstream approaches to the housing crisis. San Francisco needs City officials with the backbone to stand up for what is good for the city. This is the voice I will bring to City Hall. Seeing how the Assessor’s office can help bring housing laws out of the 1970’s and into the modern era.